From 6 March to 13 April, 2014, the Beirut Art Exhibition Centre is pleased to present, Biography of a Head, an exhibition of drawings, paintings and videos by renowned Iraqi artist, Sadik Alfraji. In this exhibition, Alfraji presents a range of recent work in the mediums of drawing, painting and video. With this exhibition, we are once again drawn into the world of Alfraji’s elemental figure. This elongated male figure painted in shades of black appears in almost all of art works featured in the exhibition. Once I Could Fly is a series of large-scale paintings featuring the silhouette-like figure, who is devoid of markedly recognisable facial features but with a well-defined head, arms and legs and who engages with the environment around him. The title piece of the show is a reproduction of previous graphic works as lambda prints and as a video installation. In these works the elemental figure is seen in various states of anguish, joy and sorrow. Another new piece shows the elemental figure on all fours as he attempts to walk a tightrope. This tightrope of difficulty points not only to the balance of life, but to the precarious situation individuals in Iraq live under on a daily basis. Alfraji’s imagistic world is also one of inherent loneliness, in which the elemental figure attempts to make connections with another. 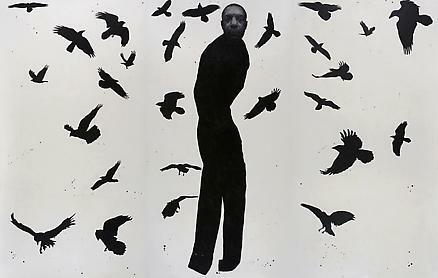 The desire for meaning and connection points to Alfraji’s life-long interest in existential philosophy and in the writings of Samuel Beckett and Jean-Paul Sartre. Sisyphus Goes on Demonstration is a video work that depicts the figure in black in various interactions with his environment. This work exemplifies existentialism through the lens of the political. Other politically inclined works include the paintings, In Baghdad, Under the Freedom Monuments I and II. In all of the artist’s works, individuals attempt to grasp situations which they have been thrust into. In Alfraji’s context this also means situations as they exist for the ones engulfed in violence and war. Biography of a Head is an important exhibition for it points not only to universal questions about existence but also to existence in relation to the context of Iraqi identity.